I have a web service URL that accepts a JSON string from a 3rd party application but it is failing with the above error. However, when I configure the 3rd party app to send to my URL my service returns 500 response. 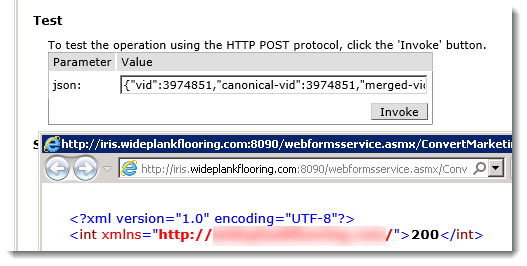 I have added the application/json mime type to IIS. at your web service, did it provide a sample on how the request parameters should look like? also, what's your 3rd party app? is it in .net, java, php, etc? The 3rd party app is HubSpot (hubspot.com) I have no control over what/how they send the data but I'm certain their POST is correct, it's something my end. It's just a string parameter, however I'm not sure I should be using a parameter as the data is sent in the RAW BODY? both required fixes in coding. for your case, perhaps you could advise the support from HubSpot (hubspot.com) and see if they can provide you some solutions to solve your issue. I'm thinking the issue relying on the approach we send the request to your web service. I've looked at both of those and they don't really answer my question as they are both talking about XML documents and my issue is with a JSON format string. my web service is just about as simple as it gets, it does no processing and simply return a 200.
can this web service be accessible publicly? on a separate note, are you able to use test tool such as "Postman"? you can try to test your web service there, and if the posting is succeeded, can you show me what is inside the dialog after clicking the "Generate Code"? and see if you could get a status 200 as the response status? <?xml version="1.0" encoding="utf-8"?><soap:Envelope xmlns:soap="http://www.w3.org/2003/05/soap-envelope" xmlns:xsi="http://www.w3.org/2001/XMLSchema-instance" xmlns:xsd="http://www.w3.org/2001/XMLSchema"><soap:Body><soap:Fault><soap:Code><soap:Value>soap:Receiver</soap:Value></soap:Code><soap:Reason><soap:Text xml:lang="en">System.Web.Services.Protocols.SoapException: Server was unable to process request. ---> System.Xml.XmlException: Data at the root level is invalid. Line 1, position 1.